There's plenty to like about the nation's leading provider of natural gas fuel for transportation, but it has proven to be inefficient at delivering value to shareholders. The investment thesis for Clean Energy Fuels (NASDAQ:CLNE) can be pretty simple. It has invested over $1 billion into developing the technology and infrastructure needed to manufacture and distribute natural gas fuels for all classes of vehicles, whether light-duty cars or heavy-duty commercial trucks. Natural gas fuels are cleaner-burning than petroleum-based gasoline and diesel and, in the the right markets, can be cheaper, too. The company's 'Redeem' brand of renewable natural gas vehicle fuels, made from landfill emissions, boasts an even friendlier relationship with the environment. Throw in the abundance of American natural gas, and the growth potential for this company quickly swells beyond its current $450 million market cap. There are many factors and trends that will support the arguments of those looking for a reason to make an investment in the company, including several favorable financial developments in 2016. 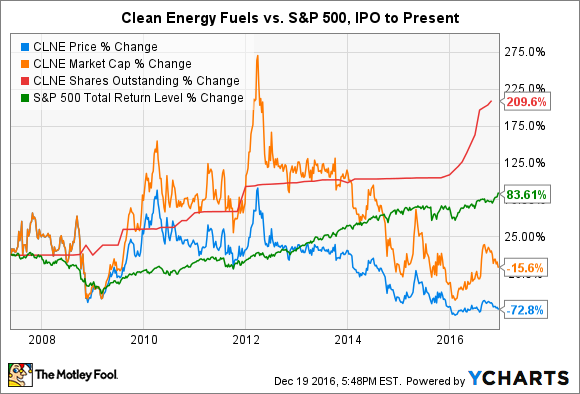 But there is one simple reason why I won't buy Clean Energy Fuels: It has proven incapable of returning value to shareholders over the long term. Clean Energy Fuels announced a flurry of deals, new station agreements, and station openings in 2016. That's great news, because network expansion will be the driving force behind its long-term growth. Transportation fuels are an inherently low-margin business, which means manufacturers make their living on volume. The company has plenty of production capacity under its thumb, so adding service stations across the country finishes the loop by turning fuel produced into fuel sold. There's just one problem: Energy market volatility has weakened the company's ability to grow volumes and profits simultaneously. Consider the worrisome trend between volumes sold in gasoline gallon equivalents, or GGE, and gross profits in recent years. Management has done a much better job mitigating this trend so far this year. In the first nine months of 2016, volumes sold have increased 6.3% compared to the same period last year. Better yet, gross profits have grown 59% and the company's net income has improved to a loss of just $8.3 million. While the gross profit and net income totals in the tables above include non-fuels sales, this year's improvement really has been helped by higher-margin fuel deliveries. It's worth noting, however, that reduced capital expenditures have also aided the bottom line. If those trends hold for the next several years, then Clean Energy Fuels may be able to achieve consistent (and growing) levels of operating profit and net income. But much of that is out of the company's control, and profitability could be further away than it appears. It also wouldn't erase the company's miserable track record of delivering value to shareholders. Since its IPO in 2007, its stock has lost 73% of its value. Not even a 209% increase in the number of shares outstanding was enough to mitigate the effect of a falling share price on the company's market cap, which is now 15% lower than on its first trading day. For reference, the S&P 500 has delivered gains of over 83% over that period when dividends are included. To be fair, the company made a wise strategic decision to issue stock and retire 2016 debt notes earlier this summer. That cleaned up its balance sheet and reduced the debt-to-assets ratio from 56% at the end of last year to 38% at the end of September. While that will increase financial flexibility moving forward, a dwindling cash position could force it to issue more shares in the near future. If the trend of improving profitability doesn't hold, things could get ugly. It can be easy to fall for a story stock, but it's important to remember that companies survive by churning out profits and delivering value to shareholders. The simple fact is that Clean Energy Fuels has not proven capable of doing so in the low-margin transportation fuels market. That's the one simple reason that I won't buy the stock.